H2O SOS is a fully-integrated water leak detection system featuring a controller, water leak sensors, and an automatic water shut-off valve. It is designed to quickly detect water leaks in your home or business and turn off the water supply to prevent water damage produced by a leak. Along with damage protection, the H20 SOS provides insurance premium savings and peace-of-mind for you when you are away from your home or business. The brain of each H2O SOS leak detection system is the controller. In the event of a leak, the controller will provide an audible alarm. It can also be integrated with your home security system to alert your alarm monitoring company. There is a series of color-coded LED lights on its front that provide a visual indication of monitoring status (monitoring on, monitoring disabled, leak detected), as well as a button that can be used to acknowledge and mute the alarm. Once the leak is corrected, another press of the button resets the system. The brawn of the system is the lead-free, validated, electronically-actuated shut-off valve which turns the water supply off when a leak is detected, thereby preventing water from continuing to flow and causing water damage. Valves are available in the following sizes: 3/4", 1", 1 1/4", 1 1/2", and 2" NPT. All valves are full-port for maximum flow performance and can be manually activated if required. 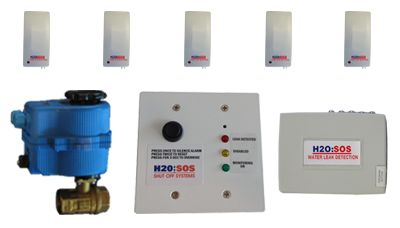 H2O SOS systems are available with both hard-wired and wireless sensors. Hard-wired sensors cost less and are normally used in new construction projects or other applications where it is easy to run low-voltage wire from the control panel to the individual leak sensors (crawl space or unfinished basement for instance). Wireless sensors are generally used in locations where it is difficult to run the low voltage wire or where a faster and easier installation is desired. We offer wireless transmitters with a built-in integrated sensor, or you can hard-wire multiple regular sensors to a standard wireless transmitter. You can use both hard-wired and wireless sensors in your system if desired. Anytime a wireless sensor/transmitter is used in a system, you will require a wireless receiver to receive the signal and communicate it to the controller. We have put together a number of residential packages to suit most leak detection needs. If one of our packages does not meet your needs, you can build your own leak detection system. To build a commercial system, CLICK HERE.